Kabir, the revered fifteenth-century poet, has for many in Northern India become an anti-caste icon. His verse, set to music throughout the diaspora, is used to challenge outmoded institutions and rigid orthodoxy. He also seems to be the patron saint of the Jaipur literary festival where many thousands of people come to take part in freethinking debate and to listen to authors from all over the world. The festival, for which there is no entrance fee, is a breath of fresh air for increasingly polarised societies, enabling them to express and embrace diverse views. The attendance list is impressive: in 2011, two Nobel Laureates and seven Booker Prize winners attended, Oprah Winfrey was there in 2012, and in 2013 the Dalai Lama and Sebastian Faulks spoke. You get the idea! Sawai Jai Singh started to build Jaipur in 1727; a visionary ruler and designer, he created a city on lines which, in contrast to the defensive mediaeval layout of the former capital at Amber Fort, are strikingly modern. Jaipur was to emerge as a commercial and business-orientated city, Jai Singh encouraging bankers and the founders of arts and crafts guilds to settle here rather than the traditional warlords. The bazaars today are a spangly treasure-trove, providing the perfect setting for the colourful sari swirls of the ladies of the Pink City. A highlight of the city for me is the fascinating Jantar Mantar, an open-air observatory where you can marvel at mammoth eighteenth-century celestial devices and sundials, all still in perfect working order. A private tour on a recent visit to the City Palace revealed my favourite room: a small hall of mirrors where slivers of glass are set on relief work, so the plants imitated seem to bulge and curve. Two candles are lit, the doors are closed and all of a sudden one can see tiny pinpricks of light refracted and duplicated everywhere. The city warrants the minimum of a three-night stay, even if you do not go at festival time. Next year the dates are from 19th to 23rd January. And so where to lodge? One small mansion or haveli is Dera Mandawa, an unpromising building on one’s approach but within a haven of peace with a large central courtyard containing a myriad of trees and shrubs. The turbaned and tall owner Durga Singh graciously receives visitors in what is very much like a family drawing room, full of photographs of his distinguished forebears. Alas, he explains, he is a scion of an aristocratic family who like all of his Rajput caste had to find some way of making ends meet as their wealth was increasingly appropriated in the decades following Independence. 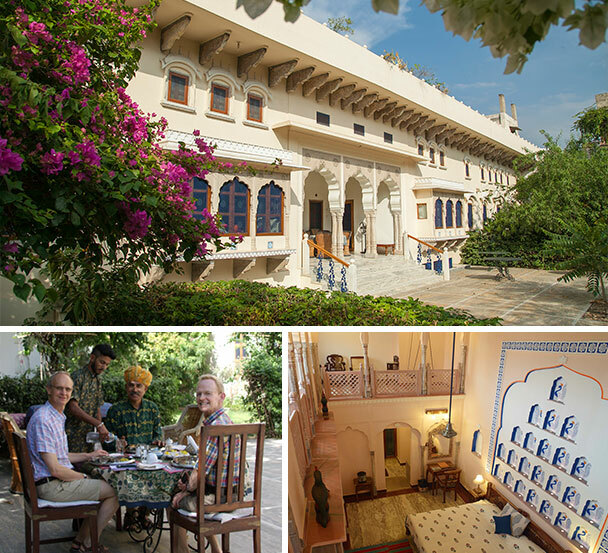 The haveli has a lovely feel to it and, mindful of how easily the young can become switched off by a plethora of visits to historical sites, Durga Singh offers classes in turban-making, kite-running and cookery. One of his rear courtyards houses his prize cows whose dung is ingeniously used to provide methane gas for cooking via a contraption with a floating cover just like a gasometer. Rainwater is collected and with an osmosis plant converted into drinking water for the rooms, reducing the use of plastic bottles. At the other end of the expense scale is the Rajmahal Palace. For a time it was the official residence of the British Political Agent and from 1958 until 1970 the private residence of HH Maharaja Sawai Man Singh II – or Jai – when it hosted visits from distinguished guests such as the Queen, Jackie Kennedy and the Mountbattens. It actually looks much more modern than its eighteenth-century origins would suggest: a massive columned portico over grand white steps leads to a central salon which is clad in rich dark wallpaper and furnished with groups of lavishly upholstered sofas and occasional tables bearing silver-framed photographs of the Mountbattens, the Kennedys and polo players. The exterior is painted in light pink and white – a combination of colours deliciously reflected in the white coats and trousers and pink flowing turbans of the army of waiters who are ready to bring tea, water or a towel at the merest glance. All the rooms have specially created wallpapers and original, reupholstered furniture – and the dining rooms, pool and surrounding walls are all art deco, the circles and diamond shapes which pierce the walls giving a wonderful lightness and grace to the whole. 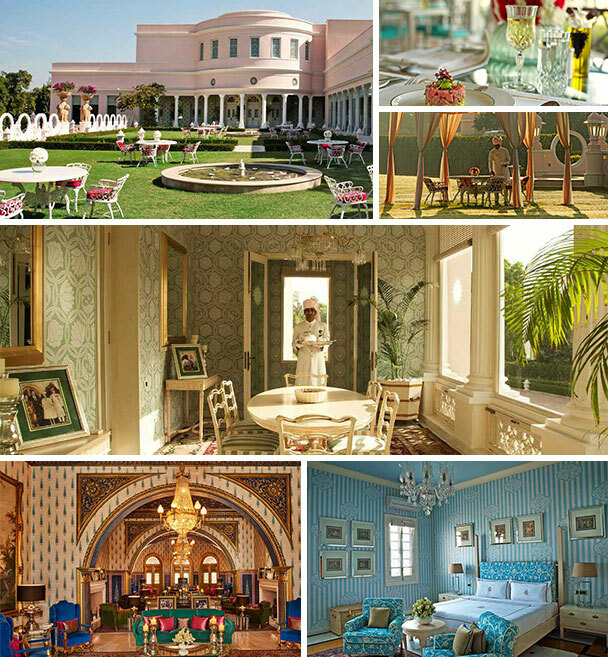 With its clean lines, pastel shades and green open spaces, the Rajmahal is a masterful reinvention of a traditional palace and a welcome palette cleanser after all the sumptuousness and grandeur of Mogul architecture. Even if at times it is like living in an interior in Wallpaper magazine one is left with an impression of an outstandingly well run and distinctive hotel.